Autopsy of some rubbish copywriting by Jonathan Wilcock, yes that Jonathan Wilcock the Freelance Copywriter who wrote this 'ere blog post etc. Hello there. I am a rubbish piece of copywriting. First thing of note is my hedline. See how it is overwritten to make it as difficult to read as possibel. You may have also noticed that a American spelling has crept in. Nothing wrong with americans or american English, but the writer is English English, as is the audience what he is amining at. SO theres the first mistake. Naughty. You may also notice the odd spelling mistake here and there. This is inexxcusibel. It happens. 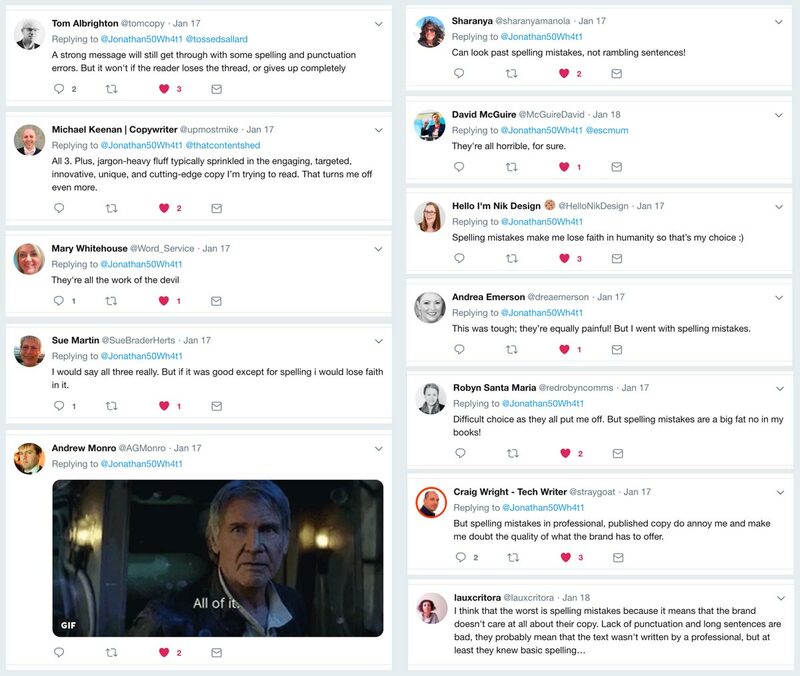 Copywriters are human, but readers can be unforgiving. 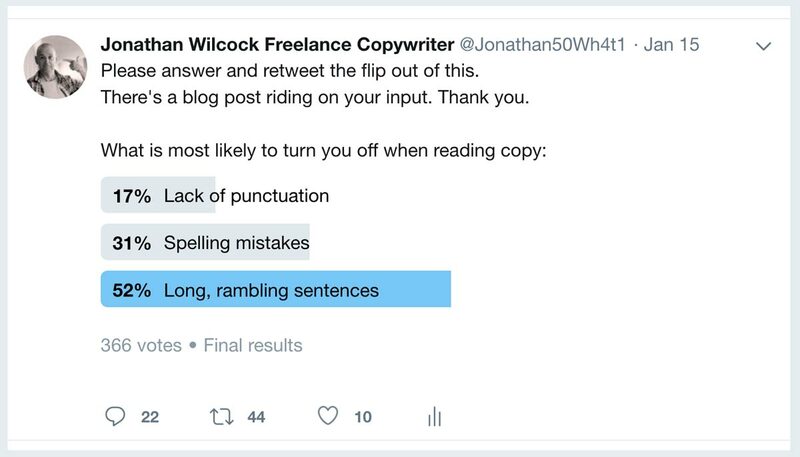 In a recent poll, carried out by So What If Industries (aka me); of 366 respondents, 52% said that long rambling sentences were even more of a turn off than spelling mistakes or poor punctuation, you know the sort of sentences that go on and on and on and on and then go on a bit more. Punctuation seemed to be the least of anyone’s concerns. Some thought this was because of the sloppy art of texting. Basically, we know it’s wrong, but we’ve given up the formality of using apostrophes and the like when faffing about with stupid little keys and touch screens. It’s easier to use a cheeky emoji and be done with it all. Bad spelling got 31% of the vote. And I wud argeu that if you’re trying to convey authority or professionalism, spelling errors are a great way of doing just the opposite. Personally, typos (as spelling errors are often referred to in the trade) are one of my biggest bug bears. So, basic spelling and grammatical errors sorted, let’s move on to other improtant matters. – Flowery, multisyllabic words plucked from a thesaurus. – Too many. Very short sentences. That are placed. Back-to-back. – Anything that makes the journey arduous, burdensome, laborious, hardwork, tedious, boring, stale, stodgy, uninteresting and repetitive, or tries too hard to make its point. – Like a goat in a top hat, nothing’s as annoying as a random analogy. Aaaand another thing that’s even more mind-boggling than the most mind-boggling thing in the whole wide world (other than ridiculous hyperbole) is the fact that the readability tool I’m using reckons that this blog post’s readability is ‘OK’. Here are the stats. Apparently stats don’t lie, but let’s just say they may be a little misguided. • The copy scores 74.4 in the Flesch Reading Ease test, which is considered fairly easy to read. • None of the paragraphs are too long, which is great. • 13.7% of the sentences contain more than 20 words, which is less than or equal to the recommended maximum of 25%. • 36.5% of the sentences contain a transition word or phrase, which is great. What is also a little concerning, is that when uploading the entire contents of this blog post, the aforementioned online grammar tool tells me that: This text scores better than 55% of all text checked by (brand name removed) where comparable goals were set. How bad can that other 55% actually be? If so, thank you for your resilience. There was once a magic rabbit called Keith who was always getting up to mischief. Back-filling entrance holes to the warren, putting his elbows on the dinner table, getting facial tattoos; the usual teenage rabbit tomfoolery. But the worst thing he ever did was lead the reader down a dark alley that strayed away from the point and didn’t really go anywhere. Oh Keith, what are you like. • All the obvious stuff that most people don’t do. ← Previous Post From German sausages to made up words, a Freelance Copywriter never stops learning.